On day 60 we were parked at Raadhuspladsen, in front of City Hall. 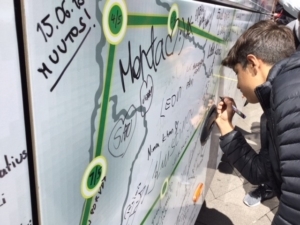 We had a steady flow of people to the #eminbus, Danish and visitors. There were many American and Canadian visitors who were very interested to know about the bus tour. 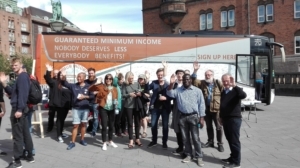 One visitor from Canada told us about a ‘basic income’ experiment in Ontario, where people on low incomes can receive a guaranteed 750 (approximately 485 Euro) per month and top this up with income from wages. Its early days in the experiment but the signs are positive, she said. We heard during the day about changes in the Minimum Income Schemes in Denmark: Lower payments for young people (under 30), reduced payments if you have been out of the country for more than 6 months, child support for up to two children only. The changes have a disproportional impact on migrants who have fulfilled the time and other conditions necessary to qualify for minimum income schemes. However, they also impact negatively on Danish citizens and have the overall impact of making the systems more complex, generating poverty and weakening people’s attachments to the society. Lisbeth Zornig, former child ombudsman and Michael Wedsoe, Vice Director of the Permanent Representation of the EU Commission to Denmark visited ad spent time at the bus. Volunteers from SAND (Danish homeless organisation) were very active at the Bus. Today was the end of the time on the Bus of volunteer and EAPN Director, Leo Williams.